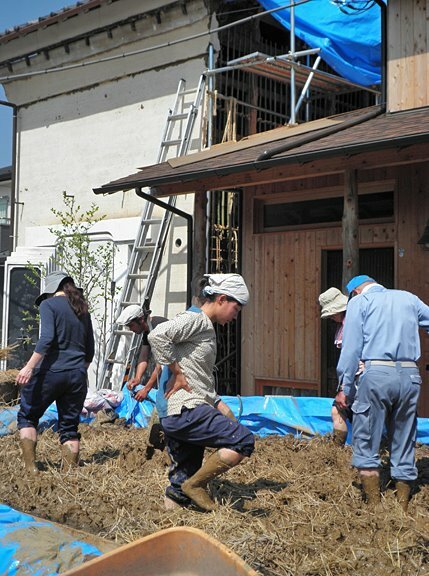 April, helped Hideyuki Konno and Sayoko Kondo with the restoration of Cafe Sorte. Sayoko is a barista trained in Vancouver, Canada and studied coffee harvesting and roasting in Hawaii. She also happens to be an excellent cook and has a great artistic sense. Hideyuki is a skilled landscaper leading the restoration, along with treehouse builder Masahiro Watanabe and natural builder Fumihiro Asano. The building being known as a Dozoh or Kura in Japanese. 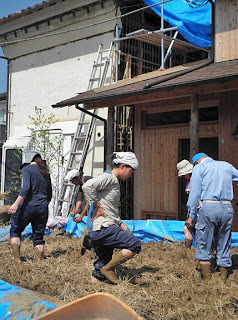 The building being restored is a 100 year-old timber-frame and earth wall storehouse, known as a Dozoh or Kura in Japanese. Dozoh and Kura where traditionally built to project valuables from fire. Then straw rope is wound around the bamboo reinforcing the mud. The second story will be plastered later in May. Once the wall is dry, the interior will be plastered. Looks great; looking forward to seeing more photos. That is awesome! 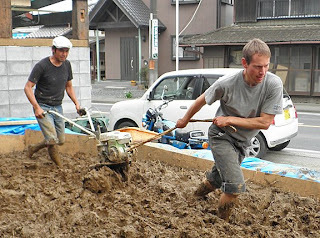 I love the old kura around here, too bad so many got damaged in last year's earthquake.